Public domain. Originally uploaded by user Siliverien, and transferred here from the author page of Jessie Smith, who is someone else entirely. Do not combine this page with that of Jessie Smith, author of Sesame Street books. They are not the same person. 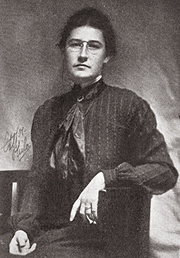 Jessie Willcox Smith is currently considered a "single author." If one or more works are by a distinct, homonymous authors, go ahead and split the author. Jessie Willcox Smith is composed of 11 names. You can examine and separate out names.